While on vacation most people look for different places to shop at to pick up trinkets from their trip or just getting some items that are needed that wouldn’t fit in your luggage on the way to your destination. Here are few of the shops that we as locals enjoy going to on a regular basis. These stores let you experience the Maine adventure in each trip. Day by day you never know what items you find you have run out of or need while you are in Maine. The jingle alone for the Renys commercial has you singing this song for days until you finally decide to go and visit one of the 7 Renys stores. Ellsworth and Belfast are the closest locations in our area of the state when you visit. If you are looking to bring home some trinkets for family and friends with the Maine logo, this store has plenty of those. Some items you will find here will be at much lower prices then if you were to buy them at a regular grocery store. For canned goods and packaged snacks, you can find some nice organic or made in Maine items that you wouldn’t normally find in the regular box stores. They usually have seasonal items for summer needs such as pool noodles,beach supplies and can’t for get the bug spray for the summer. A great selection of snow shoes, mittens and gloves for the winter months. You don’t want to get caught saying, “You should have bought it when you saw it at Marden’s”. Marden’s is one of those hit or miss stores that you give all of your money to. The versatility and quality of the products throughout the store will shock you. Many times the store receives overstock items for which you can get a great deal on. Looking for a pair of flip flops or name brand boots? Marden’s has you covered. Did your child kick off their last matching sock for the thousandth time? Mardens has you covered. This is the first store that you want to go to, to stock up at on the general every day items that you may need. When it comes time to holidays this is the go to place to find great pieces for your Halloween costume, Christmas decorations or wrapping paper is usually fully in stock. If you want to go hiking stop in an grab all the snacks that you need for your day long venture. The local L.L. Bean is an outlet that has not only new products but used products as well. Some are items that were purchased and people decided that they didn’t like the item and returned it. You may be able to go on a scavenger hunt and find your name or initials embroidered onto a back pack or maybe just start going by the name Bob if you like the item well enough. Personally I have found a great pair of their L.L. Bean duck boots and their shear-ling lined boots. They have great outdoor equipment for hiking, swimming, pet products, furniture and bedding. Snag a hiking satchel and boots then head to Acadia National Park! The chicken barn is full of different antique finds as ell as an entire upstairs floor of used books. It’s a treasure hunt for a good book through the vast selection that they have there. It’s located on the bucksport rd in Ellsworth, You will find just as the name says, this building formally was an old chicken barn that was later of course converted into the antique and book store. You don’t go into the chicken barn to find something specifically, you let the items within the building find you. Thousands of different items all the wall and walk ways of the barn. You may think you are going in looking for one thing and come out with something completely different. Momo’s cheese cake is located a few miles past the Northern Lights Maine Coast Hospital in Ellsworth. 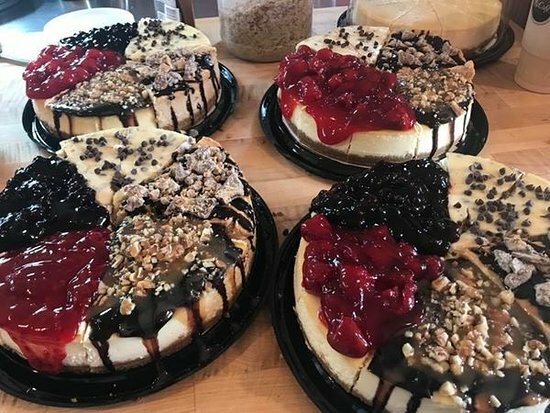 Momo creates all of her delicious cheese cakes in her home where she has converted her garage into a cheese cake paradise. You walk into her garage and stare at the array of cheese cakes throughout the different cases. There is a sign that says “our happy place”, Momo- it’s not just your happy place it’s mine too! Purchase just a slice or buy a whole cake. She often times as a variety option to choose from or you can buy one flavor. Momo gets creative with each flavor that she makes. All slices are 5.50 per slice which covers the cost of the cake and the sales tax . If you want your cake and eat it too, you have to follow the honest policy and leave your money (cash or check) in the box located in her garage. If you don’t feel comfortable going into her garage you can find her individual slices sold at Tradewinds Marketplace in Blue Hill or China Hill Restaurant in Ellsworth. Out of the 30 flavors that she whips up you are sure to find on that fits your fancy. Located off the beaten path in Deer Isle, ME- known to locals as “Sunshine”. This side of Deer Isle is where the sunrises and then on the other side of town in the village is “Sunset”. Here you will find of course the delicious jams, jellies and chutneys that could go on just about anything. My favorite is the Blueberry Preserves on a toasted english muffin or a slice of fresh sour dough bread. If you want some spice in your life, check out the hot pepper jelly. Drizzle the hot pepper jelly over a block of cream cheese and spread it on crackers or celery- this is my party snack go to! Jams and Jellies are not the only thing that you will find at this hidden gem. Embark on a whimsical adventure through the town that Peter has created along the property. There are 24 “residents” with a growing population each year. Owner Peter creates different sculptures that help create the Nellieville. Throughout his life time travels, experiences and stories heard from his childhood Peter has created the village that has a saloon, the Rosebud jail, Neville’s store and more. Word is that even a couple got married in the church. This place isn’t something you can just learn about through pictures and articles, you need to stop in and experience the trip yourself. Grab a bite to eat in the cafe and then let yourself live in the moment as you walk through Nellieville. This store shows the beautiful craftsman ship and hard work that is put into each item that is made. There are two locations, one in Dover Foxcroft and one in Bar Harbor which is the closest location to our vacation rentals. When you arrive at In the Woods you will find an array of products that line the walls and tables of the two story shop. This organization donates 100% of their profits after taxes for land conservation efforts in turn to remove the downed dead wood to make most of their wooden items. There are a lot of fun natural made products with curves in every which way. One piece that sure is unique is the multi compartment drawer that is made out of a stump. 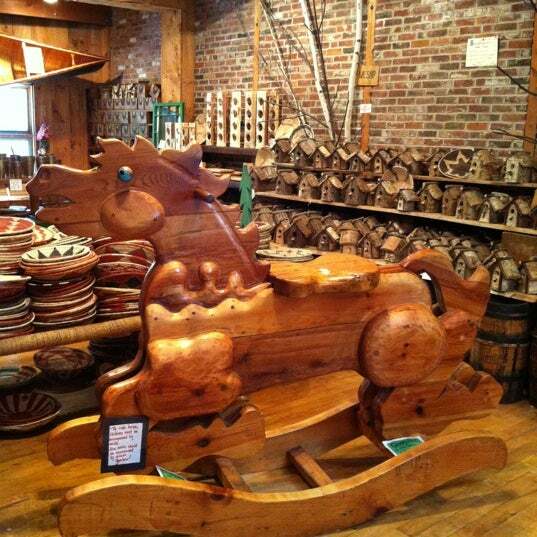 As you make your way around the store don’t hesitate to take the time to hop on the giant rocking horse located near the back of the store. This lets any adult feel like a kid again. If you plan to go hiking check out their fine selection of walking sticks that are sure to make your venture up the mountain a little easier. If you are traveling by plane and don’t have alot of wiggle room for your check in or carry on you will also find lots of wooden figurines that make great souvenirs!